At the Waiotemarama turnoff, about 2 kilometres north of Opononi, is the small historic maori settlement of Pakanae. Kupe settled in Pakanae due to the fertile river flats. There his people planted Kumara for their return journey to Hawaiiki. In 1955 "his Anchor Stone", a sacred rock was erected as an memorial to him. 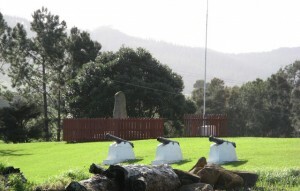 Cannons decorate the base at the marae close to the rock which resembles a cloaked figure. Guarding the approach to the marae at Pakanae are three cannons, looking back down the Hokianga Harbour. They were moved there by the famous chief Moetara, who has many descendants in the area. 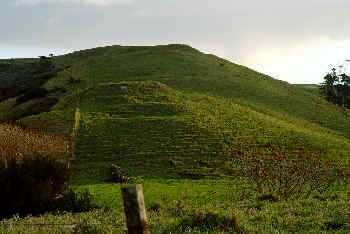 Whiria mountain is Hokianga's most famous Pa site. Whiria mountain is a large steep conical hill beside the water, surrounded by rich horticultural land which makes it the perfect strategic site for a Pa.
On the crest is a memorial to Rahiri, the 16th century chieftain who united the Ngapuhi and drove out the Ngatiava. That's why Hokianga is known as the cradle of Ngapuhi. The Pa was never conquered. In 1836, well after the wars were over, Whiria mountain was sold to the Wesleyans who established at its base a station which they called Newark. Pakanae's great chief Moetara was a reluctant convert.